Our mission is to educate the community regarding the inherent Rights of Nature, and to establish legal rights for the protection of ecosystems and natural communities so that they may exist, evolve and flourish. When: 6:00 PM, every 4th Monday of the month. Where: Growers Market (454 Willamette, Eugene). Enter door on Willamette (not the dock entrance). What would it mean to recognize the Rights of Nature? It would mean making a fundamental shift to recognize that just as human beings have rights, all other beings (including our Mother Earth) have rights. The health of the world in which we live would be a high priority in our culture, economy, and political system. Rights of nature would play a significant role in decisions that impact us all. It would mean re-defining nature, not as property, but an entity that has rights inherent to itself. How to make Rights of Nature laws a reality? Rights of nature laws by themselves can have real legal force but are weak if not connected to other system truths – corporate power and the lack of enforcement by our government and legal system. For example, water is routinely extracted, commodified, and polluted by corporate and other human activities with little to no financial, civil, criminal, or moral accountability. This is unsustainable as all of life depends on clean water for survival. Until nature – including rivers, watersheds, and all waters – possess the legal right to exist and persist, there is no satisfactory legal mechanism to ensure that clean water is protected for all life. This means a broader community rights approach is needed – one in which corporate behavior is controlled by the people when it attempts to violate the rights of nature. For that control to have the greatest strength, it must come from the rights of communities to be self-governing. 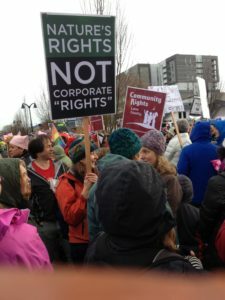 Community rights will keep corporate power in check. This includes the ability to block state & federal preemption laws that allow corporations to override rights of nature and those of the community. An essentially different relationship between humankind and nature is necessary; one that reflects our dependence on nature and need to live in harmony with the natural world. This requires providing the highest legal protection, one that recognizes the rights of both humankind and nature to health and well-being. CELDF (Community Environmental Legal Defense Fund) is a pioneering leader in the effort to secure the rights of ecosystems – or the “rights of nature” – working to develop rights-based legal frameworks to protect the environment. CELDF has assisted communities in the U.S. and Ecuador in establishing the first rights of nature laws in the world, and is now working in the U.S., Nepal, India, and elsewhere to build on these successes. How Do You Put a Price Tag On Nature?